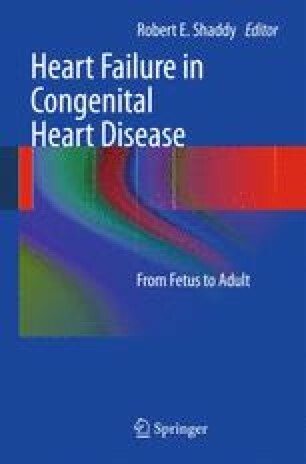 There are two major causes of morbidity and mortality in children with heart failure: arrhythmia and pump failure.1, 2, 3, 4 Even in patients receiving treatment for their heart failure, pre-transplant mortality has been shown to be between 12% and 25%, with 25% of deaths secondary to an arrhythmia. The pediatric electrophysiologist can now offer therapies that address both causes of mortality, and potentially improve both quality of life and functional capacity. Abnormalities in the heart rhythm are a relatively common occurrence in children with heart failure. In the patient with congenital heart disease and heart failure, both atrial and ventricular arrhythmias are frequently seen. These arrhythmias may either result from or lead to further destabilization of the underlying hemodynamic status. Assigning cause and effect can be extremely difficult in this situation.